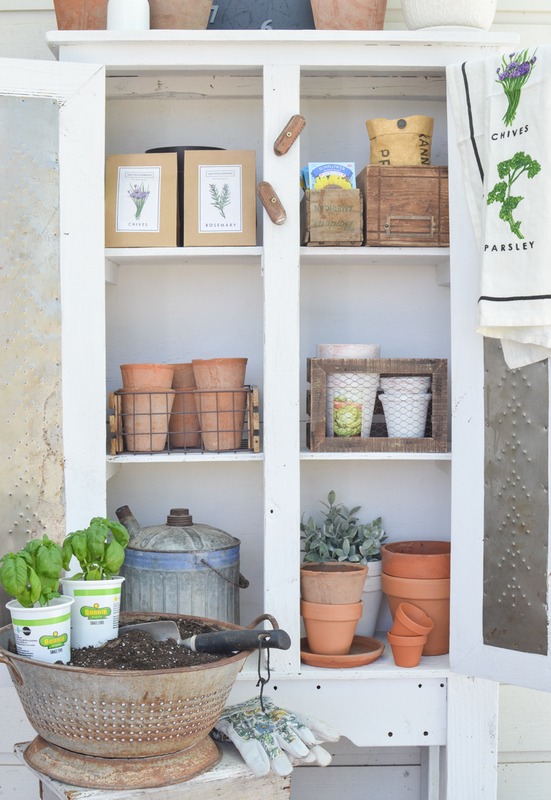 So I used Rust-Oleum chalk paint in Linen White to give this cabinet a fresh new look. 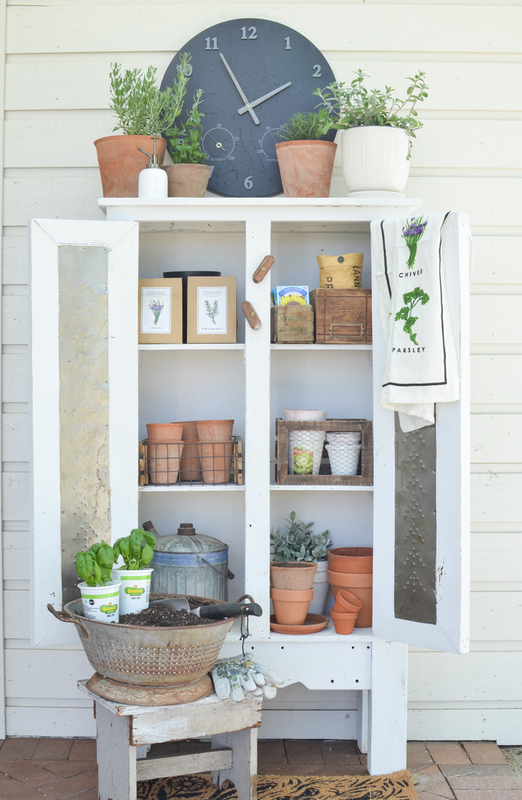 Then my vision for this was to basically turn it into a place to store all my extra pots and gardening goodies. You know, wanna-be plant lady things. 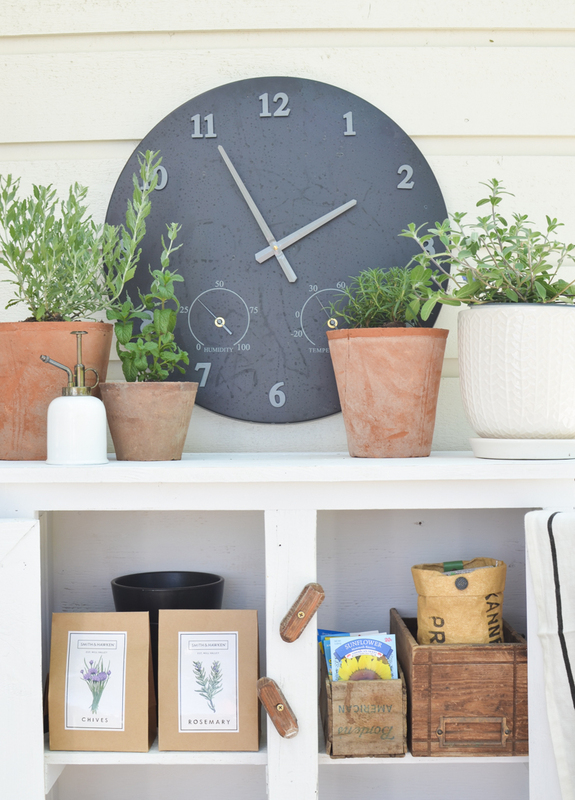 I picked up this large outdoor clock at Target and I love how it looks against all the white. You know I’ve been obsessed with black accents lately, so this clock is perfect. I also snagged these cute seed kits, which I think are too adorable to actually plant so I’m basically just using them as decor! 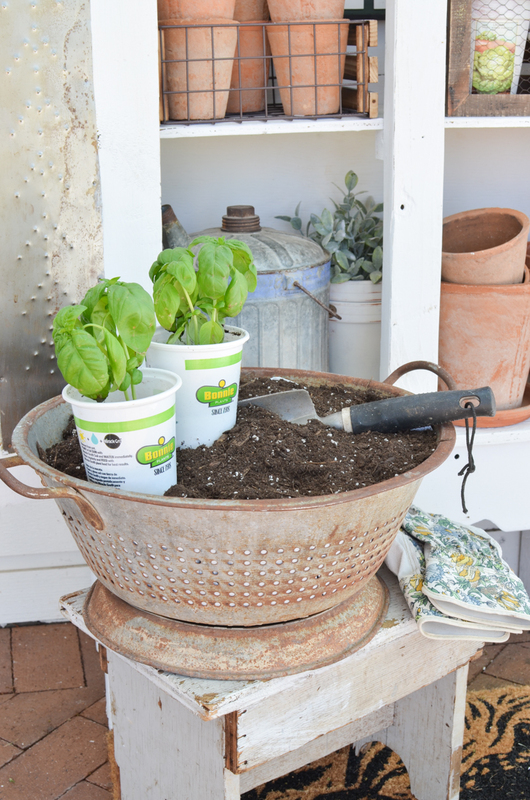 I lined the inside of this large vintage colander with a trash bag and then filled it with potting soil. Turns out it’s actually super handy and the trash bag does a great job of keeping the soil from falling out through the holes. I LOVE the little tin panels on this cabinet. I think they add so much character and charm. And don’t they remind you of an old vintage pie safe?! 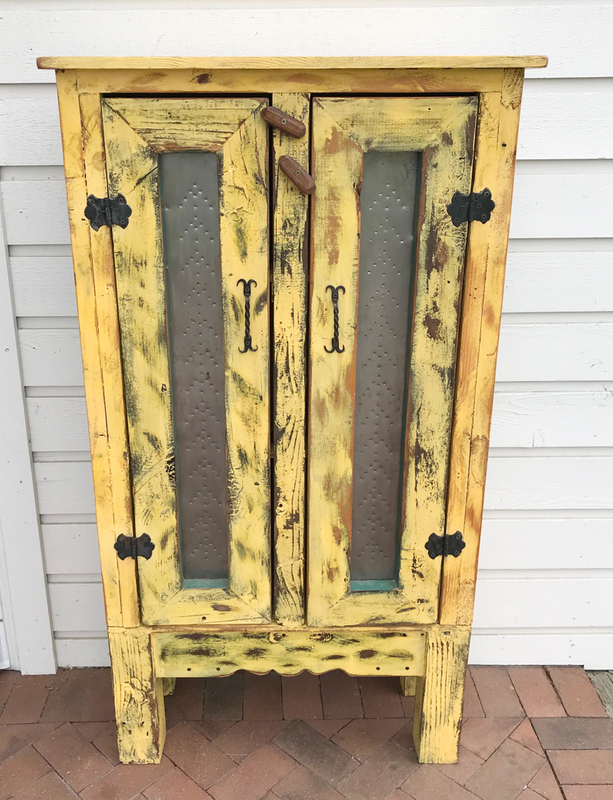 They definitely give this cabinet an antique vibe, even though it’s not an antique at all. I’m pretty happy about the fact that this cabinet isn’t sitting empty anymore. And I’m also happy that I didn’t get rid of it like I thought about doing. This thing actually has a lot of sentimental meaning since it dates all the way back to our first house–I just wasn’t loving it anymore. Do you have pieces like that in your home? Things you don’t really want anymore but you hold onto it because you feel like you should? It’s kind of weird place to be in, but I’m just glad I was able to find a way to repurpose this cabinet into something that I love. It only took a little paint to give it a fresh look and now it serves a brand new purpose on our back patio! Sarah -seriously I felt like I was looking at a display in Magnolia Market – you have to do a book about decorating on a budget , you are the best , your projects are always such a big transformation at very little cost . Your Mom -Rest in the knowledge and promise of Psalm 91 . Thank you Becky, thankfully she is doing much better! Prayers for your sweet momma. 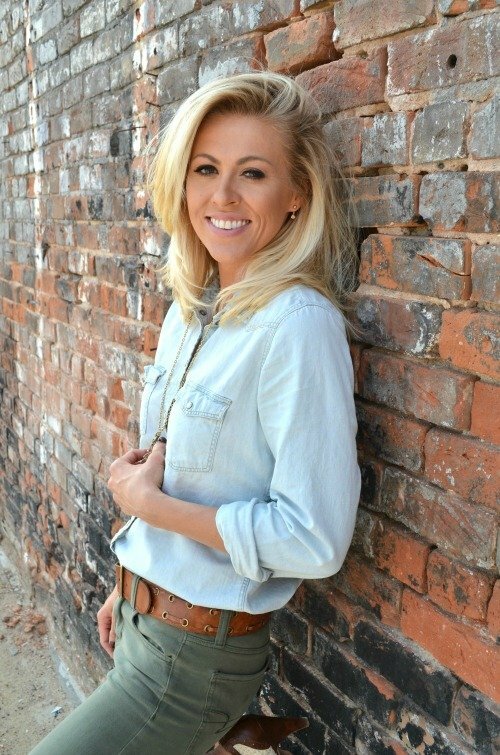 Your blog is such an inspiration to me glad your back! Aw thank you Pam, I really appreciate that! 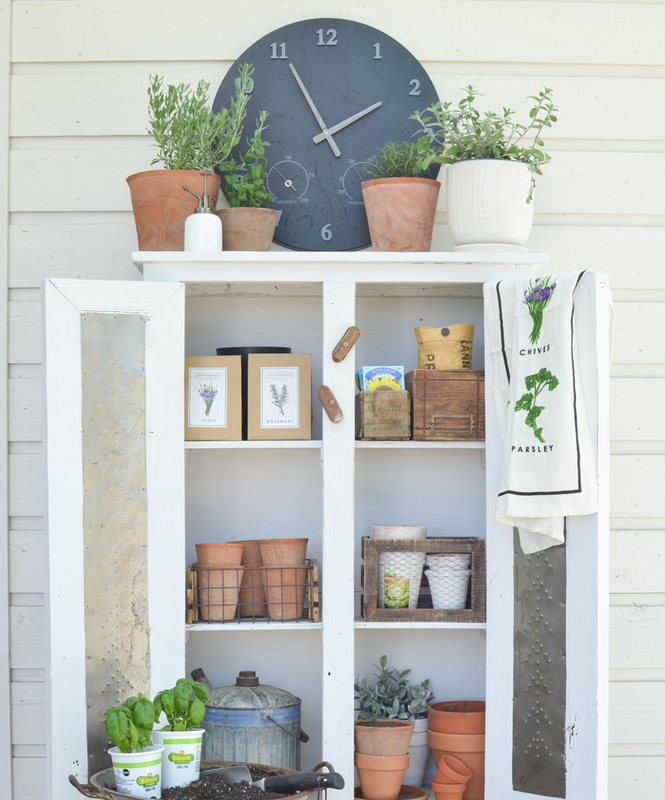 What finish on the chalk paint did you use for outside use? Love how it turned out. I just did a clear poly on top to seat it. So sorry to hear about your mom, may god continue to bless her and watch over your family. I am loving this storage cabinet/pie safe!!! I too have a love of things that were once in the family and are now in my home. I am going crazy with white paint and white chalk paint. Thank goodness I have white farmhouse furniture in my living and dining rooms!!! Just painting all the accent pieces I have. 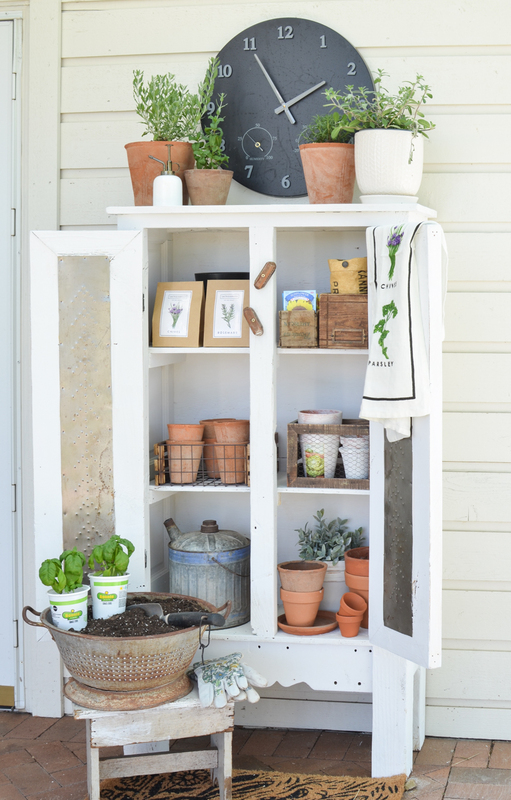 Does your cabinet under a porch or does it get rained on? I have been wanting one on my patio, just unsure how it would do in the summer weather. No it’s not under the porch, so it will get rained on….I’m not sure how it will hold up, but so far we’ve had a dry summer so it hasn’t been an issue really. But I did use a clear poly so that will help. Prayers for your mother. I miss mine every day. You do such a nice job on everything ! Sarah, this looks absolutely adorable! What a transformation! I need to do this to our plant stand that we have. So much inspiration! And prayers to your sweet mama. 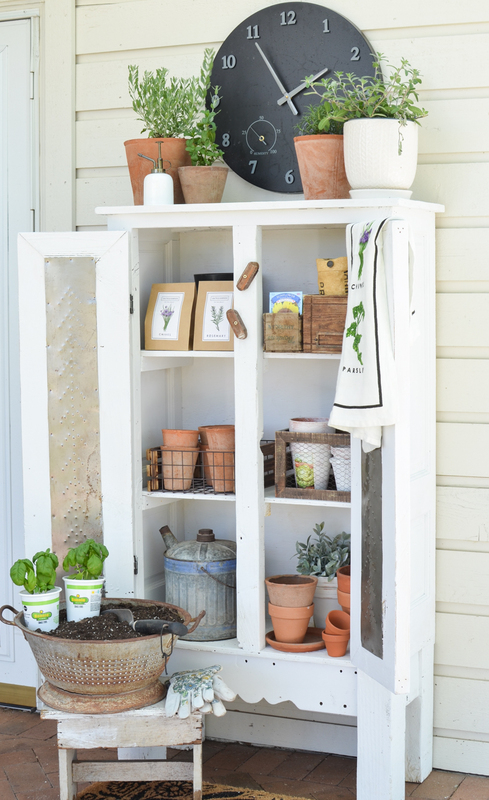 I totally am going to be on the lookout for a cute little cabinet to redo for my porch! Love that!! yes definitely!! Add it to the yard sale list! Sarah, So sorry to hear about your Mom. Praying for her and your family! 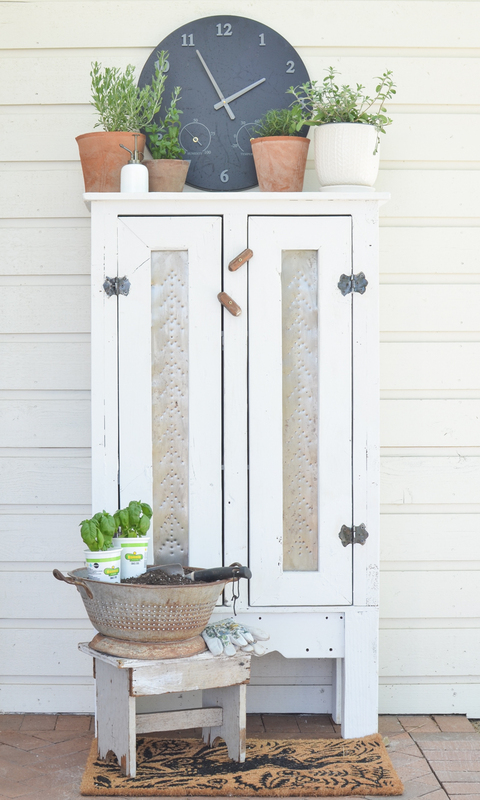 This cabinet transformation is lovely! So so pretty!! I love it! So glad to hear your precious Mom is doing much much better. I pray for Gods continued healing touch for her! That means so much to me, thank you Teresa! So stinking cute. I love pieces like that. I’m also so happy your Mom is doing better. I say a little prayer every day for you both. did you steal this since its outside? also sending prayers for your family. yes with a clear polycrylic! I LOVE the redo — fresh look and ALL the things you tucked inside. 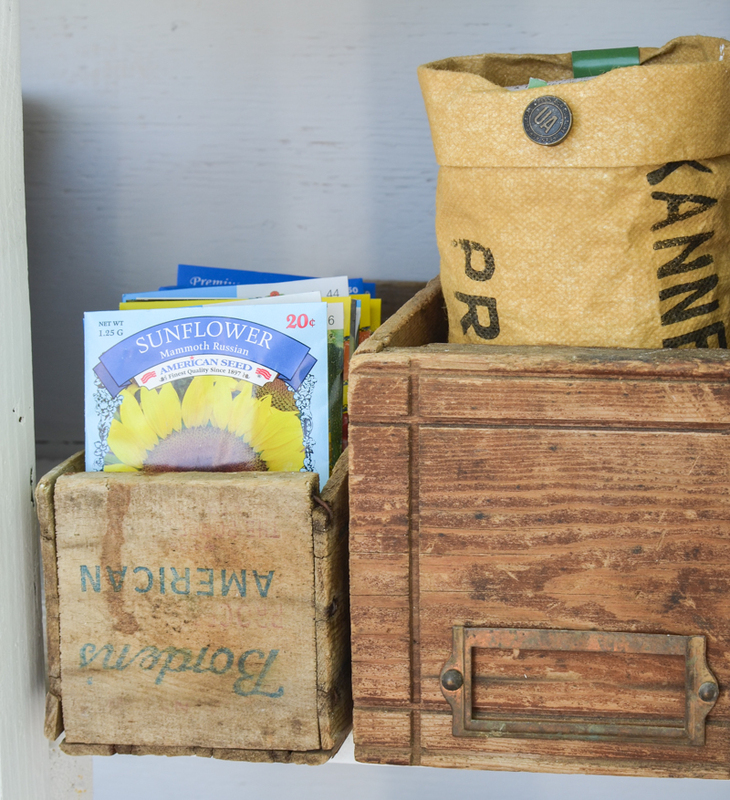 You are sending me to my wooden crates to see if I have one to use for my seeds! Just wondering why you didn’t keep the cute door handles? I thought they would look good as a black accent! That’s a good question Jane! To be honest I was planning to replace the door handles because the ones that were on there before were a little too cowboy/rustic for me, if that makes sense. I totally planned to pick up some new ones at Hobby Lobby but I never got around to it, so I just left them off! Such a perfect choice for the little cabinet. I love how you remake and updo older pieces in such a creative way. So many blogs these days have gravitated towards just purchasing the wanted piece rather than creatively approaching it with things on hand or less expensive items. You balance both so well and keep your own voice in your decor. I hope your mom is doing much better and allso want you know that we all have her in our hearts and prayers for you. Aw Tanya, you are such a sweetheart. Thank you for the kind words and support, it truly means so much to me! And I’m grateful for the prayers too, thankfully mom is doing better and on the mend. She’s actually going to stay with me for a few days while she continues to heal! love how you repurposed it. such a pretty cabinet in white. Aw thank you so much Brenda!! I can’t tell you how much that means to me. And I’m sending those prayers right back in your direction for things to work out for you. We know God will take care of it all! And I LOVE that verse. Definitely one of my favorites! This is my style totally! I ha e a similar piece I’m using as a tv and toy storage but one day!!! That’s funny you mention that because this cabinet was used for toys for a brief time when we first moved into this home. And now it’s a garden cabinet. It’s really been through it all!! Sarah, glad to hear your Mom is recovering, God will certainly bring her through this time as well as support you and your family. Love the transformation on the cabinet, the Linen White is the right color, you did a great job. Thanks for sharing the inspiration!! haha you know what Sherri, I totally thought that same exact thing!! 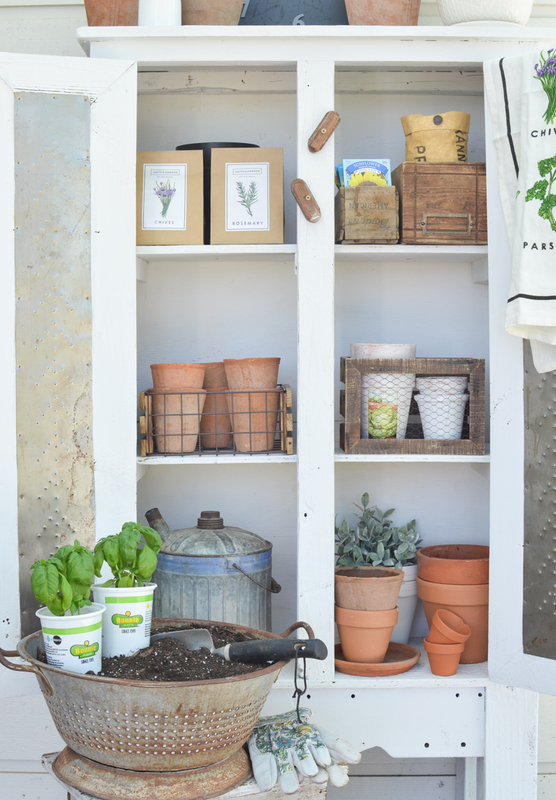 How many seed packs have I thrown out over the years when I could have just used them as summer decor?! Good thing they’re pretty cheap! Sarah, first I need to tell you that I am so happy that your mom is doing so much better……my beloved mother is living in a nursing home in Blair, Nebraska. Our family is so richly blessed to still have her with us at 94 years old….like you, I treasure every single day ❤️ Now about your darling cabinet ‘make over’……it looks amazing! Great job! Ah what a blessing to have your mom still going at 94!! That is amazing and I just pray both of my parents make it that long. What a gift that is!